I recently admitted to a friend that I enjoyed exams in school. It’s the kind of admission that draws a quizzical head-tilt, which may just be the best kind of admission there is. The kind that makes a person wonder who you actually are, deep down. I’m not sure what makes a perfectly sensible person (or me) enjoy exam season, but I think at its core it’s probably all about impatience. Papers and projects stretch out over semesters but exams are quick, like ripping off a Bandaid. Ninety minutes of misery, then I can go have a beer. I think I have also always enjoyed the opportunity to prove myself under pressure. I like the feeling of urgency and the imperative to perform. In school this became a sort of dangerous game, taunting the passage of time and testing to see how late I could leave my preparations while still posting a passing grade. These little experiments were not always successful, but I like to think I learned a bit about myself in the process. As a grown-up1 I try to be more sensible in my approach to things, preparing further in advance and better managing my time. Sometimes I succeed in this, to a degree. But deep down I still like to be tested. I still crave the pressure. I think that’s why I like guiding birding tours; they’re like big final exams. You study and prep, pore over maps, read eBird lists, double-check the details, and then the day arrives where you have to put it all on the line. Positive reviews and happy clients are a passing grade, and failure is not an option. The reason for this little tangent is that I currently find myself in familiar territory. Whenever I studied for a test, I always reached a moment the night before when I could study no longer. Regardless of how much I thought I knew or how prepared I was, I could do nothing but close the books and try to relax. That’s where I am now, in that moment of quiet. The calm before the storm. Tomorrow I begin leading a 10-day tour of Quebec with Eagle Eye Tours, and for the past few weeks I’ve been studying. But now with the books closed I’m looking for a diversion, and I can think of none better than to write a little about a one-word-bird I’ll be searching for a week from now: the Razorbill. A Razorbill, showing off to some penguins. The Razorbill belongs to a group of birds called Alcids, and you can think of them as the Northern Hemisphere’s answer to the penguins. All Alcids are stocky-bodied, black-and-white, and dive for fish in cold, oceanic waters. They use their wings to propel themselves elegantly beneath the waves, but they’re ridiculous and clumsy on land. Unlike the penguins they do possess the gift of flight, although they’re not particularly good at it. The most famous Alcids are the puffins, but they all have two-word names and so are unworthy of further discussion. The Razorbill may not have the beak-appeal of its better-publicized cousins, but a couple of strategically-placed white lines on its face give it a sort of understated allure. The source of its most excellent one-word name is not hard to fathom, as its prominent bill is laterally flattened giving it a razor-like appearance. It probably looks that way in part to help the boys attract the girls, although its thinness likely also helps it snap shut on unsuspecting fish. Two Razorbills, sharing a laugh at an off-colour joke about penguins. Like many Alcids, Razorbills nest on treacherous seaside cliffs that make predation a challenge for foxes and other land-bound hunters. In the spring and summer they can be seen with ease at these breeding colonies, but if you prefer more of a challenge2, fall viewing is where it’s at. Once nesting is complete, these hardy birds head out to open water where they will spend their entire winter, not returning to land until the following spring. 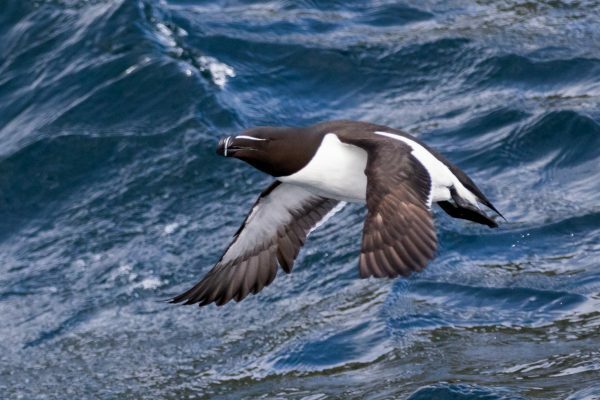 Keen observers on, say, a whale-watching tour may spot Razorbills bobbing in the surf. Weirdly, most people on whale-watching tours do not. 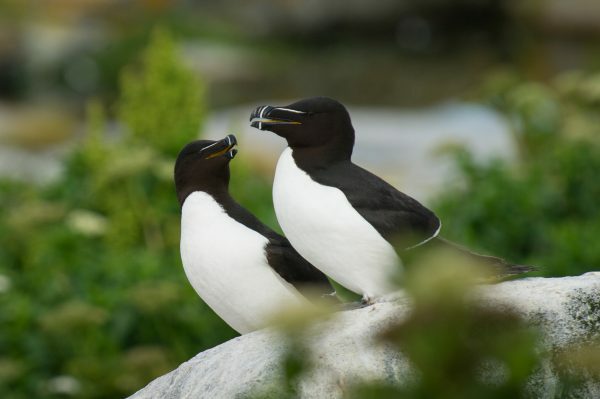 If you – like me – happen to live inland, you are likely missing out on the Razorbill and its relatives. To me, the birds that live at sea have always been among the most exciting. Braving the bitter cold and relentless wind they thrive in an environment few creatures can, and it’s worth a trip to the coast to catch a glimpse of the incredible life they lead. If you’re heading out to Alcid territory be sure to study up before you go; it would be a shame to arrive unprepared for the exam.